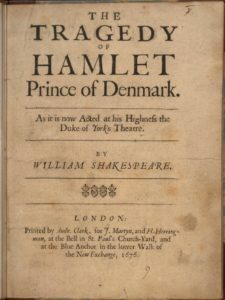 William Shakespeare’s Hamlet follows the young prince Hamlet home to Denmark to attend his father’s funeral. 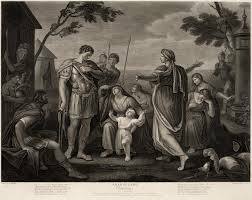 Hamlet is shocked to find his mother already remarried to his Uncle Claudius, the dead king’s brother. And Hamlet is even more surprised when his father’s ghost appears and declares that he was murdered. Exact dates are unknown, but scholars agree that Shakespeare published Hamlet between 1601 and 1603. Many believe that Hamlet is the best of Shakespeare’s work and the perfect play. The dramatist’s genius is also evident in his transformation of the play’s literary sources-especially the contemporaneous Ur-Hamlet-into an exceptional tragedy. 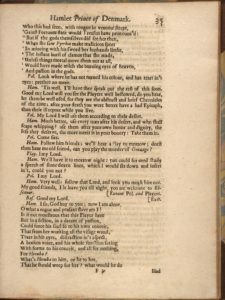 The Ur-Hamlet, or “original Hamlet,” is a lost play that scholars believe was written mere decades before Shakespeare’s Hamlet, providing much of the dramatic context for the later tragedy. Numerous sixteenth-century records attest to the existence of the Ur-Hamlet, with some references linking its composition to Thomas Kyd, the author of The Spanish Tragedy. From these sources, Shakespeare created Hamlet, a supremely rich and complex literary work that continues to delight both readers and audiences with its myriad meanings and interpretations. The play opens with Prince Hamlet depressed over his father’s death and his mother’s decision to marry the new king, Claudius, after only two months. Hamlet goes to the ramparts after Horatio, his confidant, tells him he saw a ghost. That evening, the ghost of King Hamlet tells Hamlet that his brother, Claudius, killed him. Hamlet swears to avenge the murder. 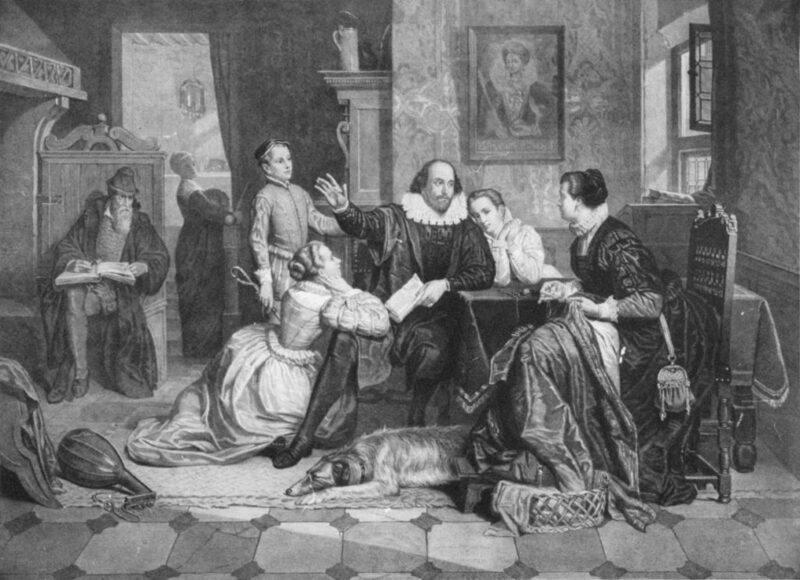 Polonius discloses to King Claudius and Queen Gertrude that he suspects Hamlet’s madness stems from his love for Ophelia, Polonius’ daughter. Hamlet arranges for a play in which the actors perform a scene similar to the actual murder of King Hamlet. Upon seeing the scene, Claudius calls for lights and storms out of the room. Claudius prays and Hamlet hears him confessing to the murder and attempting to absolve himself of sin. Hamlet refuses to take action since Claudius may go to heaven. Hamlet speaks with Gertrude, and Polonius hides and listens to the conversation from behind a curtain. Hamlet hears Polonius and kills him. Claudius sends Hamlet to England because of the murder. Laertes returns to Elsinore after hearing of his father’s death, and Claudius tells him to blame Hamlet. Hamlet returns, and Claudius advises Laertes to duel with Hamlet. Claudius plans to have Laertes kill Hamlet with a poisoned tip sword. To ensure Hamlet’s death, Claudius intends to present Hamlet with a poisoned goblet of wine. Gertrude tells Claudius and Laertes that Ophelia drowned in a creek. The duel begins and Hamlet scores two hits. Gertrude grabs the poisoned goblet and drinks to Hamlet’s fortune. Laertes manages to wound Hamlet, but in the scuffle, they exchange swords and Hamlet injures Laertes. Gertrude falls and says Claudius poisoned her. Laertes tells Hamlet he will die as well, and Claudius planned everything. Hamlet stabs Claudius and kills him. how his life relates to modern man, what his relationships can teach us about human interaction, and more, will forever attend any examination of the play. So long as unanswerable questions persist, the play will captivate us. However, some points of reference to which most critics, actors, directors, and academic interpreters agree do exist. One given is that, from the start, Hamlet has a clear imperative to act on his medieval blood feud: to avenge his father’s death by killing King Claudius. His emotions tear him in two. On the one hand, he possesses the basic male need to assert his manhood and to right grave wrongs. On the other, his Christian, moral knowledge tells him that murder constitutes a sin no matter what the cause. Hamlet represents the polar opposite of his uncle/father King Claudius. Claudius personifies the Machiavellian villain: he justifies his wrongdoing by aggrandizing the ends his evil produces. He recognizes his own evil and acknowledges his doomed status. Knowing that he will assuredly descend into Hell makes Claudius no less eager to commit crime after crime in order to keep his ill-won spoils. The desire to resist hating him moves the audience, and the fact that he is so conversant with his inability to seek absolution keeps him from being one-dimensional. Rather than hate him, we root for his conversion, hoping that he will confess and show contrition. He does not, and we become less and less forgiving. Hamlet is Claudius’ antithesis. The Prince knows he owes a debt to his father’s commands and to the old order which dictates that he must commit a sinful act. But his fear that the action is wrong paralyzes him. Though the end would justify Hamlet’s very existence, it would not justify his defiance of the commandment against murder.